Mini roulette is based on the conventional European version and has a single zero wheel but only 13 numbers: "0" and 1-12. Due to this fact it is much easier to place bets and win rewards. Let us have a closer look at this gambling miracle! Mini roulette is extremely popular among players who choose relaxing gambling if front of the home computer screen. Those who think that mini roulette game offers small payouts are mistaken. Gamblers can enjoy multiple types of stakes both inside and outside. Examine the information presented below and make sure that the odds in mini roulette are decent. Straight bet is the highest type bet that allows betting on any number on the roulette wheel layout including zero slot. Payout in this case will comprise to 11-1. Street bet is a kind of bet placed on 3 attached numbers. The chip must be laid down on the outside line of the desired numbers. You win if any of these numerals will the result of the spin and the payout will be 3-1. Corner bet is a type of stake placed on 4 numbers and a payoff is 2-1. You should lay down the chip in the center of 4 numbers. 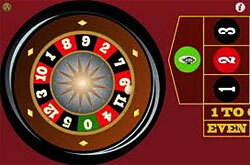 The outcome of the roulette wheel will determine the winning numbers. Consider yourself the winner if the ball will land on one of your numbers. Split bet is a stake placed on 2 numbers with a payout of 5-1. Players should place the chip on the line that connects two desired numbers. This type of the bet can be applied to the following combinations of numbers: 0 & 1, 0 & 2, 0 & 3. Three bet Gambler places the chip on the junction of 3 numbers s/he wants to bet on. In case the ball will come to rest on any of these numbers, you may celebrate the victory and receive a payout of 3-1. Column bet allows betting on 3 vertical columns. To make this variation of bet you need to place your chip on the right side of the row. The payoff here comprises to 3-1. Red or black bet includes wagering on certain group of colored numbers of the red or black "team" (the payoff is 1-1. Players lay the chip outside of the roulette table either on the black or red box. Odd or even bet takes place when you put a chip on one of the squares which are labeled "odd" or "even". This is a bet with 1-1 payout on a combination of six even or odd numerals on the roulette table. Half dozen bet is made on a six numbers group. The chip is laid down on one of the squares labeled as 1 - 6, 4 -9, 7 - 12.